Home » Gold & Blue Magazine » Tweet, Post, Repeat. Just a few years after graduating from St. Mary’s University, Erika Rendon (B.B.A. ’12) is doing things she only dreamed of as a student. Now assistant press secretary to Julián Castro, Secretary of the United States Department of Housing and Urban Development, Rendon’s job is to manage Castro’s official social media presence, keeping thousands of Americans informed about the agency’s work. But before landing her dream job, Rendon knew she would need more than a bachelor’s degree in business. “While in school, networking and building relationships was something that was always encouraged,” said Rendon, who was actively involved in many student organizations. 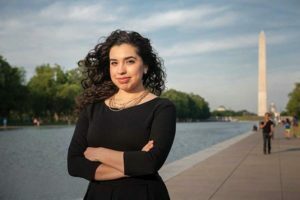 She made her way to Washington, D.C., through the Public Policy Fellowship Program with the Congressional Hispanic Caucus Institute, where her networking skills continued to pay off. After interning in the press shop for U.S. Senator Chuck Schumer of New York, Rendon gained an interest in government press. The Corpus Christi native now works alongside Secretary Castro and is responsible for managing the secretary’s social media (Facebook, Instagram, Twitter and Periscope) and making sure his policies and efforts are amplified on all of his social media accounts. “It’s been an amazing experience. He focuses on the importance of the power that local communities have on making change for people if given the resources and opportunity they need to succeed,” Rendon said.